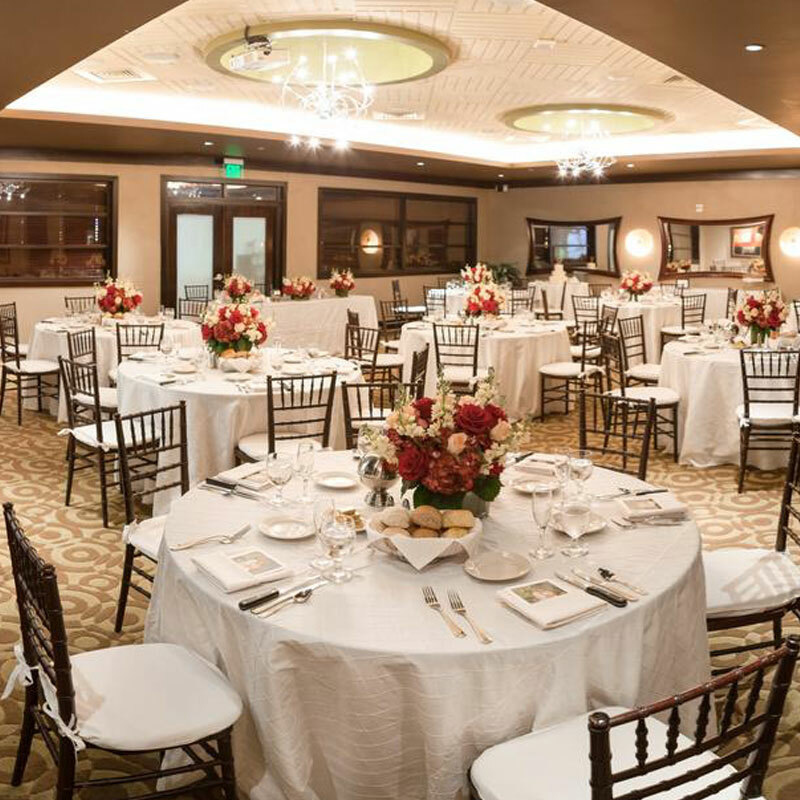 The Grill Banquet Hall, with its simple, modern interior design, is perfect for intimate wedding receptions, birthday and anniversary parties, bridal and baby showers, or company conferences. This hall offers premium audio and visual equipment, including a projector and monitor compatible with PC and Apple products. It is also set with an iPod connection. The banquet hall accommodates up to 85 people for banquet-style seating with two additional standard tables. It also includes use of The Grill’s ADA accessible restrooms. Dark wood finish tables and chairs are included with the hall rental. 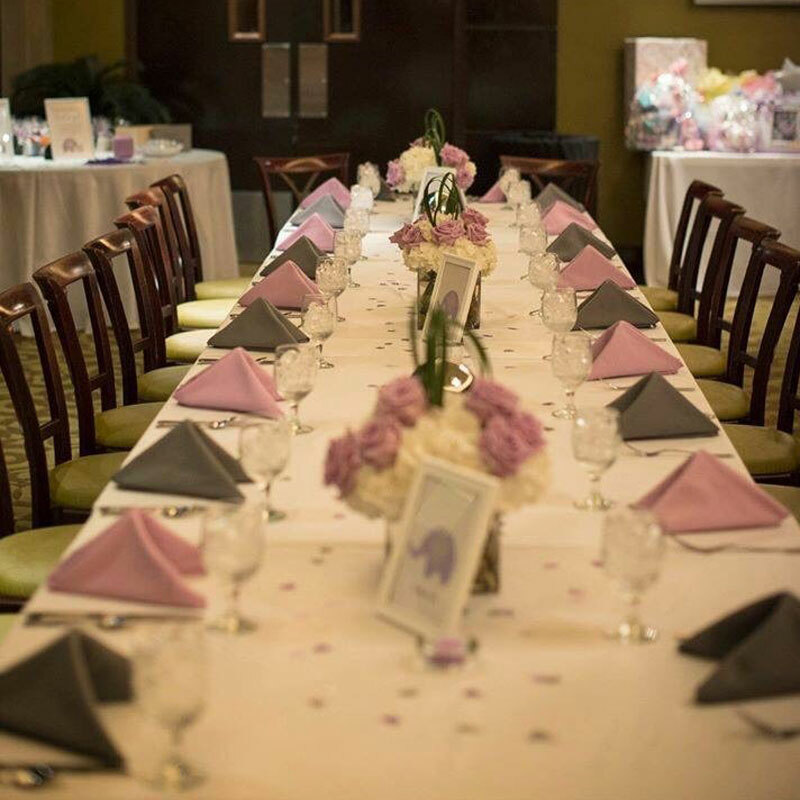 The North Banquet Hall, with its elegant interior design, is perfect for wedding receptions, quinceañeras, anniversary parties, or company conferences. This venue accommodates up to 150 people for banquet-style seating or 200 people for theater-style seating. This hall offers fully operational premium audio and visual equipment, including a projector compatible with PC and Apple products. Restrooms located on the east and west side of venue. Tables, linens (white, black, or ivory), and chairs are included with the hall rental. The South Banquet Hall, with its majestic open design, is perfect for grand-scale wedding receptions, quinceañeras, sweet sixteen, or anniversary parties; or company conferences. This venue accommodates up to 350 people for banquet-style or theater-style seating. 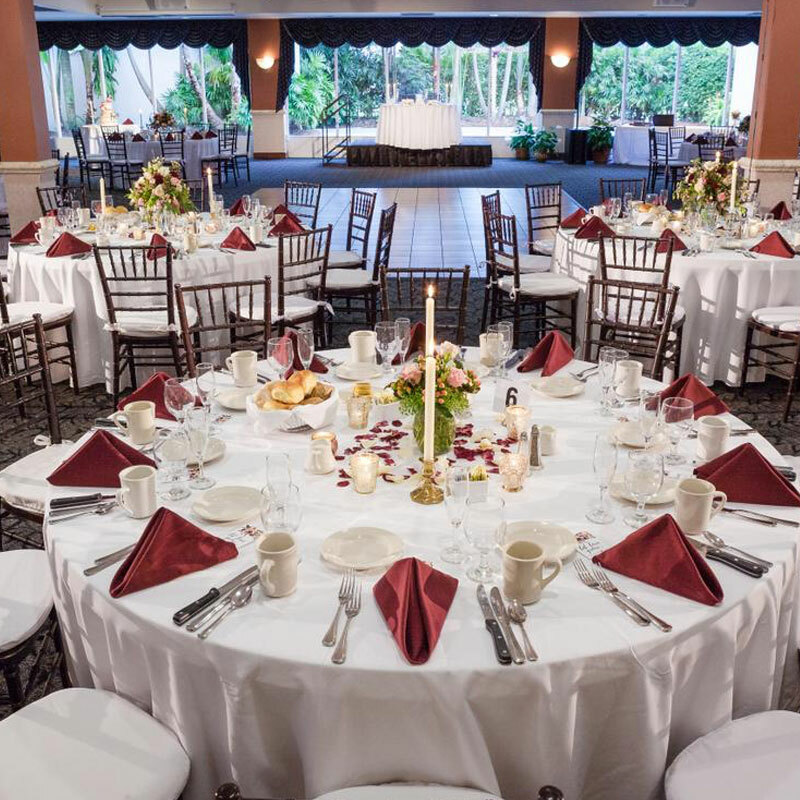 The South Banquet Hall provides a view of our lush private verdant courtyard—elegant black-out drapes are available upon request. Public restrooms are located within 20 feet. This hall offers fully operational premium audio and visual equipment, including a projector compatible with PC and Apple products. Tables, linens (white, black, or ivory), chairs, and a custodial staff to provide setup and teardown of the provided equipment and furnishings are all included with the hall rental. Note: You can book the combined North and South Banquet Halls for $800. The Executive Boardroom has a maximum capacity of 17. It is carpeted and air-conditioned. This elegant boardroom has a built-in counter with a sink in one corner, is furnished with vertical blinds, and can be used for meetings or classroom. Note: The Executive Boardroom rental rates are dependent upon the technological equipment requested. The Café offers an open Mediterranean style. This quaint venue is suitable for small social gatherings, wedding receptions, meetings, and activities. Public restrooms are located adjacent to the venue. Included in the room rental are light wood finish tables and chairs. This venue accommodates up to 85 people for café style seating. Our audio and visual equipment has recently been updated, offering new monitors. The Garage offers a rustic, vaulted wood design for hosting various corporate gatherings, weddings, and other special occasions. Public restrooms are available. Included in the room rental are tables, chairs, and white, black, or ivory linens. This venue accommodates up to 100 people for banquet style seating. Our audio and visual equipment has recently been updated, offering a whole new level of A/V support.